Two men have been acquitted of criminal damage at a site owned by defence company BAE Systems after arguing they acted for the greater good. The Reverend Daniel Woodhouse, 30, and Samuel Walton, 31, broke into the site in Warton, Lancashire, on 29 January. They said they were trying to stop Tornado jets being used by Saudi Arabia to bomb Yemen. A district judge in Burnley accepted their beliefs were sincerely held and found them not guilty. After the verdict at Burnley Magistrates' Court, the two men said they did not regret taking the action and "would do it again in a heartbeat". "We did not want to take this action, but were compelled to do so in order to stop the UK government's complicity in the destruction of Yemen," they said in the statement. Mr Woodhouse, of Armley Grange Drive in Leeds, and Mr Walton, of Cromwell Road in Lambeth, south London, accessed the site but were prevented from reaching the aircraft by BAE Systems' security. They said they wanted to disarm the jets. 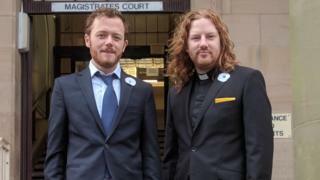 The pair's lawyer, Mike Schwarz of Bindmans, said Mr Woodhouse, a Methodist minister, and Mr Walton, a Quaker, relied on their religious conviction to explain their actions. "Sometimes moral and legal arguments coincide. This is one such case," Mr Schwarz said. A spokesman for BAE Systems said: "We note the verdict today. This matter was for the magistrates' court to resolve."